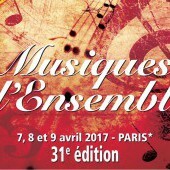 The 31st Fnapec Musiques d'Ensemble Competition will take place between April, 7th and April, 9th 2017 at CRR de Paris. Trio Zadig as well as Arod, Van Kuijk and Yako quartets, ProQuartet residents, won this competition. Applications until March, 20th 2017!